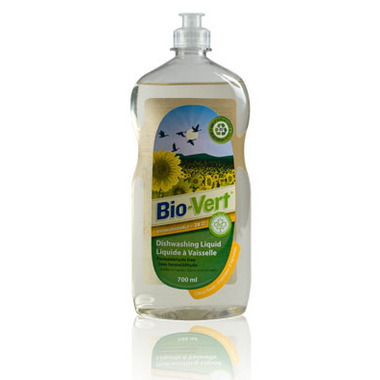 Get your dishes clean while staying green with Bio-vert's eco-friendly dishwashing liquid! Read about it in ecoholic and it does work really well. Don't find any difference from when you use the commercial brands so I love that it isn't as chemically bad but still gets the job done. First time I heard of this product was in the Eco-holic Home book written by Adria Vasil. She gave it a good rating so I tried it out and boy, was she right. It works way better than all the Green dishsoaps I've tried. Great product! Cleans very well, even greasy stuff, and the bottle can last forever if you limit the quantity you use. A single drop is often enough. One of the best I ever tried, and definitely a favorite. The most effective, long lasting green dish soap I've tried. Wouldn't say its super gentle on hands but doesn't aggravate eczema like some best selling major brands do yet cleans very well. Still using this dish soap....it's so long lasting and fresh! Cleans great , and keeps my crystal sparking. I love everything about this one....cleans very well, smells fresh, not drying to my hands and a little goes a long way! I also buy Canadian as much as possible. I really enjoy this product because it doesn't create a great amount of sudsing which in turn requires a lot of rinsing and water usage. In fact, when I have run out of machine dishwashing detergent I have used 2 tablespoons of this product in the dishwasher and don't have to worry about suds leaking all over the floor. It does a great job on both fronts! Now this is a product! It is excellent, even in my hard water. I have yet to experience the awful feel of greasy dishwater. The product rinses clean, and leaves my hands very soft and smooth. I would highly recommend this product. We've been using Bio-vert products for many many years and have nothing bad to say about it. Bio-vert gets the job done. From greasy dishes and stains on coffee cups it cleans it all up. Just stock up though when they do go on sale, all natural and biodegradable products tends to be expensive. i was so impressed with this cleaner. i don't wash dishes because of the chemical detergents, and haven't found a good natural one. used this to clean off cookie batter and it worked like a charm. less bubbles, but bubbles don't equal clean lol..that takes getting used to. very nice product....and gentle on your hands as well! Impressed with this product. Only a few drops works great. This is my favorite dish washing liquid. Scent is perfect, mild. Bubbles last longer than any other green dishwashing liquid. Best of all it's Canadian! Of all the earth-friendly types of dish washing soap that I have tried, I like this brand the most. The bubbles last longer and it does a good job. I also like the Bio-Vert dishwasher tabs and am glad to see that this is a product that Well will be carrying soon. Now I won't have to trek all the way to Costco to buy them! Suds well, eco friendly and lightly scented! Very happy with this eco dishwashing liquid. It has a nice light scent and works great. Excellent choice for all! No harmful chemicals, doesn't irritate sensitive skin. Cleans well, been using it for 6 months along with the other natural products in the house and all of our children have stoped having alergies. This is my favorite "green" dishwashing detergent. It works great. This is my favorite dishwashing liquid! It has a nice, not too strong scent and has good cleaning power. Also like that it's made in Canada.